Nan Rich Is No One’s Scapegoat, So Just Stop It! Someone recently directed me to an article that declares that if Charlie Crist loses to Rick Scott, Nan Rich is to blame. After a series of side-eyes towards that article, I decided to weigh in on the subject myself. First, Charlie Crist hasn’t lost, so why the post-mortem on the reason/reasons? Wouldn’t supporters of Charlie Crist better spend their time getting out the vote and making sure a story outlining the reason he lost isn’t necessary, instead of trying to piss off Nan fans? Now, let’s look at the Nan Rich situation a little closer. Media, Bloggers, and hell, even some in the Florida Democratic Party leadership ranks spent the better part of Nan Rich’s campaign saying she was a non-factor when it came to Charlie Crist. It was declared that she was a non-factor when it came to this Gubernatorial race. All sides treated her this way. People even got upset because Nan had a group of grass-roots supporters who went balls to the walls for her and her campaign, myself included. I seem to have written an article or two that riled the hell out of some of y’all! LOL!! Still, though, they declared she was a non-factor. Now articles are popping up saying she isn’t doing enough to help Charlie Crist win, and if he loses, it is all her fault? That gets a HUGE side-eye from me. Why all of a sudden is Nan Rich a factor in a possible loss??? Let’s be real here. I have been an outspoken critic of my party, the DEMOCRATIC party, for a while now. Is it because I hate them? Of course not. It’s because I want us to do better by ALL that make up this party, and not just a select few. I will continue to keep my eye on things and hold accountable WHOEVER occupies the Governor’s Mansion. Nan Rich listened to my concerns and gave me a lot of feedback, but one very, very important piece of feedback she gave me was to get more involved. She told me that I had a voice, and that I needed to use it. She explained to me that the main reason she got into politics was to help those that needed it. To be the voice of those who felt voiceless. I don’t know about anyone else, but that is MY kind of politician. Nan Rich was the inspiration behind starting the Democratic African-American Women’s Caucus. She told me that if I didn’t like something, I needed to at least try to change it. Guess What? That is exactly what I did, and from the response the DAAWC has gotten not just here in Florida, but around the country, it is working. Nan Rich isn’t African-American, but she cares about our community every bit as much as she does about any other community, including her own. 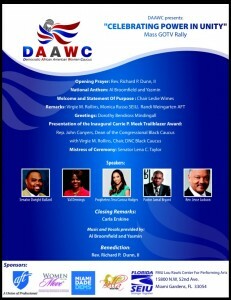 She recognizes that Black Women need an organization such as the DAAWC. She encourages getting more participation in the Democratic process by everyone, by any means necessary. 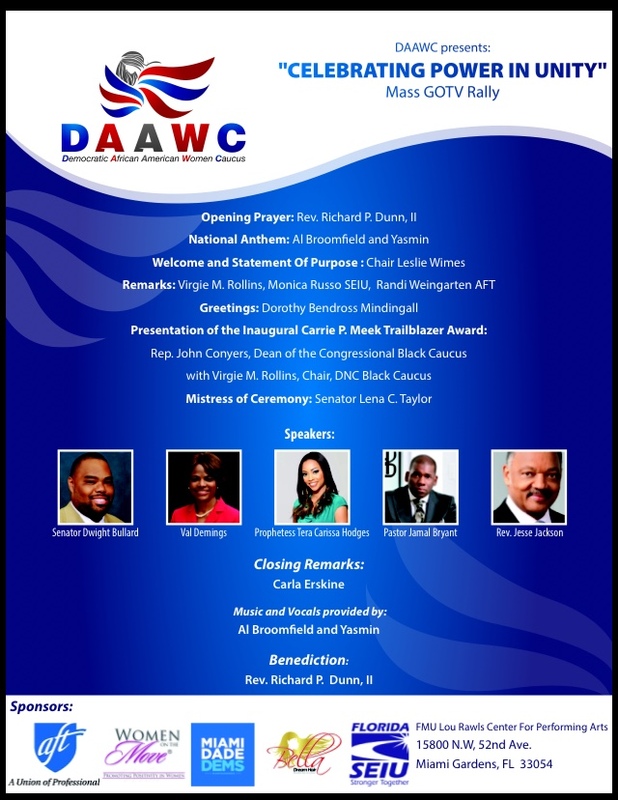 Today, the DAAWC is holding a mass GOTV rally in Miami Gardens at The Lou Rawls Center For Performing Arts. Rev. Jesse Jackson, Pastor Jamal Bryant, Congressman John Conyers, Sen Dwight Bullard, Tera Carissa Hodges, Virgie M. Rollins, Sen. Lena C. Taylor, Val Demings, Monica Russo of SEIU, Randi Weingarten of AFT. This rally couldn’t possibly help Nan Rich, she isn’t the candidate. Who can this rally help? Why none other than Charlie Crist. It is well documented that he needs a large turnout in the African-American Community to get the job done. Hmmmm…..well what do you know. Nan fans aren’t standing on a corner waving signs that read “Nan fans for Charlie”, but we ARE organizing events that will only HELP Charlie, not HURT him. You can always tell a person’s character not by what they say and do for people when everyone is looking. It is what they say and do when no one is looking. 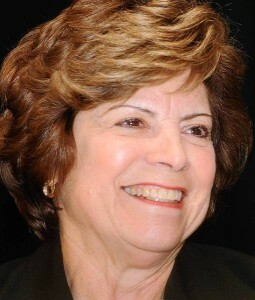 Nan Rich is a sponsor of this event that can only help Charlie Crist win this election. If I hadn’t told you, you’d never know. Have several seats and shut up! Thank you Leslie for speaking truth to power. That article upset me so much that I personally wrote to the author and when he continued to defend his stupidity I told him where to go. [not as diplomatically as you] Some people are just dumb and dumber.